Self Learning Digital Tool - "Basic Prepositions"
This is my tiny attempt to teach prepositions to my children. I prepared this PPT to understand the usage of the words well. I think such material will help better than the videos. This will give a scope to the students learn independently and repeatedly. You can download and teach on your mobile or laptop. When you click on the word it shows the usage along with audio. If a student needs to listen the audio again he can click on the speaker button to listen again and again. You can download the PPT from the below link. Once you download the ppt click on "Read-only" to open it. Hope you like this. Thanks! 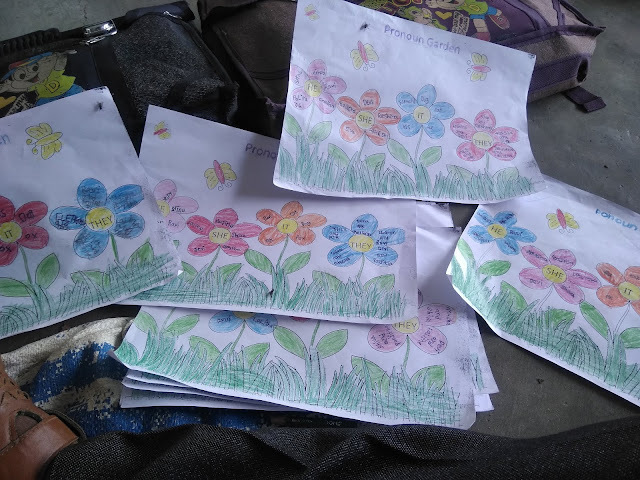 Task Based Learning Activity to Teach a Story! Topic: Amar was late to school. Class: 5th grade (Primary) Skills: Speaking and reading. Material: Picture cards and Story Slips. A Simple Primary writing task on "Trees"
Mind Maps are good triggers to develop writing skills. I gave this writing activity after the completion of the lesson "Green is Life." 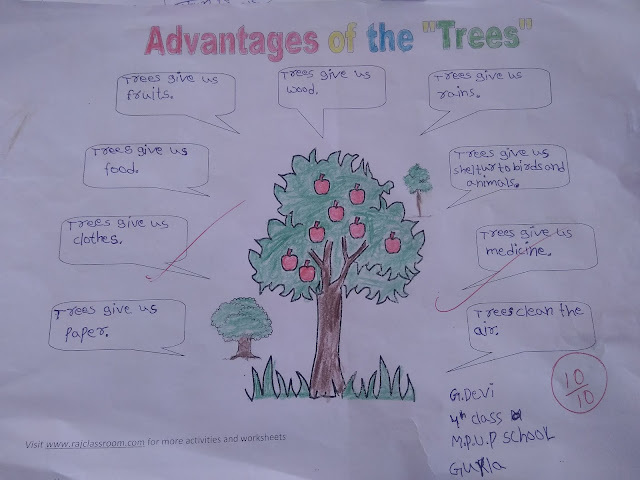 I highlighted the advantages of the tress during the lesson. After that, I asked my children to write about the uses of the trees in groups. Then I called them to present like "Trees give us food. Trees give us trains..etc." In the next period, I gave this worksheet to write what they have learned. Teaching "Pronouns" - Digital Interaction and Writing Task. Topic: Pronouns Garde: Primary Material: Digital Presentation (PPT) and Worksheet Skills: Reading and Writing. We are in the 21st century and students are smarter than the teachers. Students need more contextual knowledge and diverse explanations on the topic. So introducing the technology in an innovative way is required nowadays. Along with that, we should need testing tools to evaluate the students and diagnosis our teaching procedure. So I am using different worksheets to evaluate my students along with the Digital material. Teaching grammar for primary children is somewhat difficult. We cannot teach grammar rules in the primary stage because their cognitive level cannot accept and understand such critical matters. 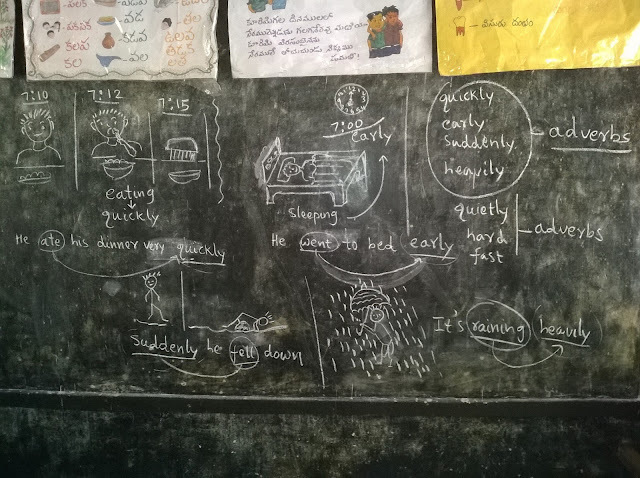 So I always use an interactive student-centered material to teach grammar informally in the part of a lesson. You can find different innovative activities to teach grammar in my previous posts. Here I prepared an interactive self-learning student-centered digital material to understand the common and proper nouns for the students. Repeated and kinesthetic learning will be taken place in using this material. This will lead to getting the concept very easily and retain the concept in their brains forever.